Now is that time we see great use of fall colour with ‘Hardy Mums’ or ‘Garden Mums’ in displays in patio pots and landscape beds. Amazing fall themed colours with reds, purples, oranges and yellows all screaming attention. We love this plant – and get frustrated by its many and often confusing names. Starting with the simple common name - we call them ‘Mums’ as that is short for Chrysanthemum – that makes sense – but oh those pesky botanists have spent the past few years messing with our beloved ‘Mums’… The botany community is responsible to keep all our plants in separate groups and use the more formal names in Latin to help all keep everything straight. 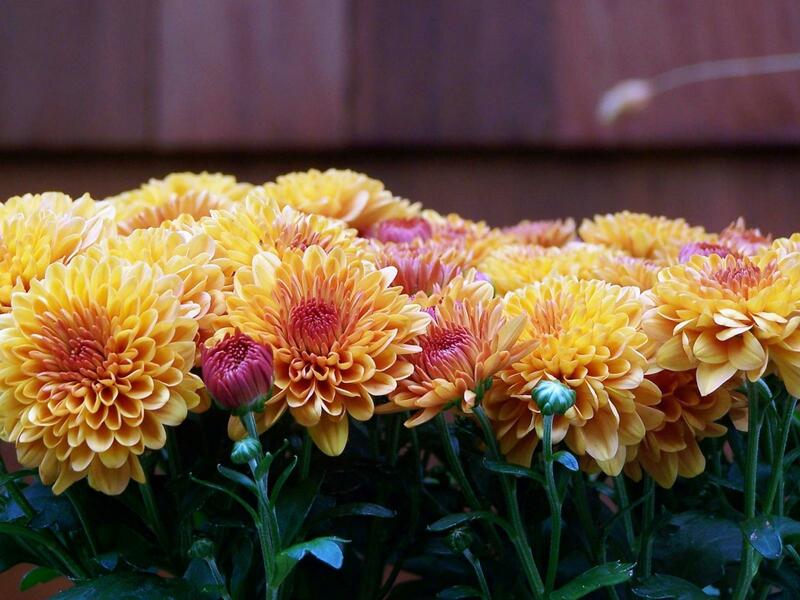 A few decades ago they started messing with our poor ‘Mums’ and we saw the formal name change from Chrysanthemum morifolium to Dendranthema morifolium and then – we assume after much angst - they changed the name back to Chrysanthemum! Cue the cheering – we can still call them ‘Mums’!! The other silly bit is the name ‘Hardy’ as part of the name. Hardy is one of our gardening buzzwords and is used to talk about how well a plant survives winter. Hardy is used to separate one-season plants like annuals (such as a marigold) from their more ‘hardy’ perennial cousins that will reliably come back every year (such as a hosta). Keyword here is the word ‘reliable’ – as while most ‘Hardy Mums’ are rated to zone 5 – which covers much of Ontario – there are a number of reasons why these great plants could be called ‘Only Sort of Hardy Mums’. Our much beloved ‘Hardy Mums’ tend to grow shallow roots – that are easily winter killed – as well we tend to plant them into our gardens in the fall and the plants do not have time to get established before winter. We love these plants for fall colour – and we use them as a one-season plant and don’t try to keep them over winter. Not to be outdone by the great Mums – we have a few similar odd name issues with bulbs and pansies. This is the time of year to get your tulips, daffodils and other spring flowers bulbs planted. Plant then in fall – they bloom in spring – and we sometimes call them ‘Fall Bulbs’ and we sometimes call then ‘Spring Bulbs’ – ouch! No wonder we get confused with plant stuff! What matters here is that you are planting some of these amazing fall planted and spring flowering bulbs. Pansies get brushed with the same naming oddities – and the good news here is that the same pansy plants that we plant in spring also work well in fall. So we see ‘Fall Pansies’ or ‘Winter Pansies’ talked about as a plant that will add a splash of colour now and then in a mild winter we will see the plants pop up with spring colour. Pansies in Ontario will not survive a harsh winter and will do better if we have good snow cover. We use them the same way we use Mums – and plant them to enjoy now and not worry too much about their over winter performance. To further assist you with your landscape needs – we recommend hiring a professional.